We sell the Dutch Fe-Migration Mending test (DMT) as well as a complete packages including all materials needed to make remoistenable tissue and using the DMT and sponge-blotter system. The Dutch Fe-Migration test was developed in cooperation with Birgit Reissland, Frank Ligterink and Han Neevel (Cultural Heritage Agency of the Netherlands, RCE) as well as Bas van Velzen (University of Amsterdam, UVA). The Dutch Fe-migration mending test is a filter paper impregnated with a bathophenathroline solution in ethanol. 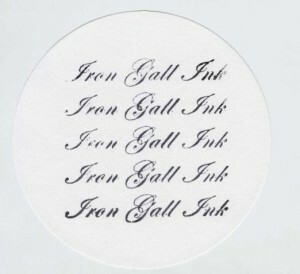 The paper is stamped with an iron gall ink. Bathophenanthroline is a specific indicator for iron (II) ions. It forms an intensely magenta-coloured complex with iron (II) ions. Therefore, papers impregnated with bathophenanthroline can be used as an indicator for the presence of iron (II) ions. Where the paper turns magenta, iron (II) ions are present. Doing local repairs with commonly used adhesives and methods can induce spreading of invisible but detrimental compounds (iron(II)ions, acids) out of ink lines into surrounding paper areas, spreading ink corrosion. The Dutch Fe-migration mending test can be used to make the invisible visible. The migration of the invisible compounds becomes perceptible only after years showing dark halos. Therefore, the risk is often underestimated. 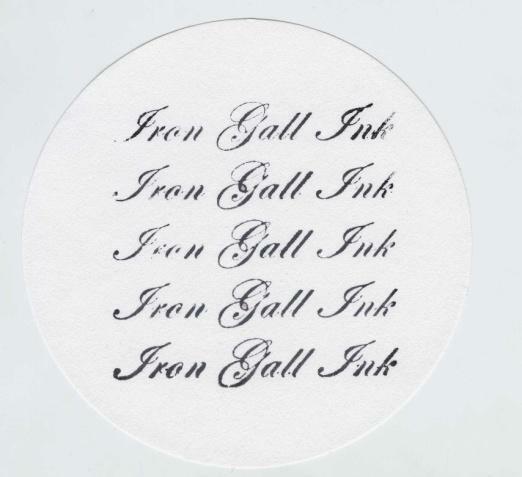 The test paper shows you directly if there is any migration of iron ions from the ink lines after applying your repair method (adhesive) unto the test paper. This test paper is a migration control tool. It should be used before doing the repair on originals. In this way the conservator has control over the amount of water applied during the local repairs. To avoid the spreading of ink corrosion when doing repairs, we recommend the use of the ”Dutch Fe-Mending Migration test” and the use of remoistenable tissue and the sponge-blotter system. Practice-in-Conservation sells the Dutch Fe-migration mending test per package of two papers. In our How to package you will find everything you need to make your own remoistenable tissue and to perform repairs on iron gall ink. 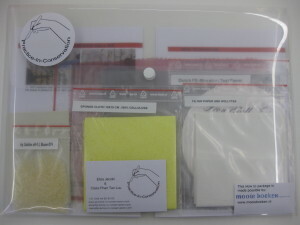 In the package you’ll also find a sheet of Berlin tissue (2 gsm) and 2 Dutch Fe-migration mending tests to immediately get you started. – How to make remoistenable tissue. – How to do a repair. – Information about materials and equipement.